There’s no stopping the Netflix revival machine. 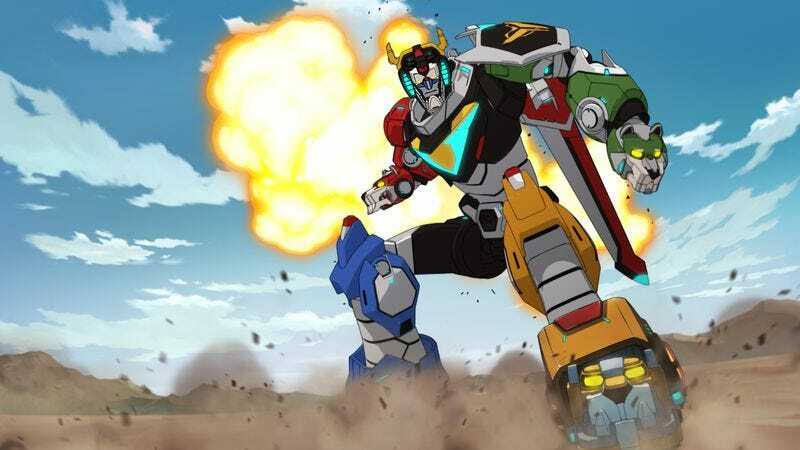 The company continues to reach into the past for programming with Voltron: Legendary Defender, a reimagining of the ’80s cartoon about five boys fighting the forces of evil in lion-shaped war machines. The original American Voltron: Defender Of The Universe was a heavily edited and sanitized adaptation of multiple unrelated Japanese series, but the Netflix show is a brand-new project spearheaded by Joaquim Dos Santos and Lauren Montgomery, veterans of shows like The Legend Of Korra, Young Justice, and Justice League Unlimited. That’s a strong pedigree, and while Voltron: Legendary Defender definitely meets the high standards of those projects on a visual level, it leaves much to be desired with regard to story. The general concept of Voltron isn’t especially challenging: Five space explorers from Earth find themselves on an alien planet where they become pilots of lion robots that assemble to create the humanoid mecha-warrior Voltron. They join forces to fight the evil King Zarkon and his army, and it doesn’t get much more complicated than that. Dos Santos and Montgomery have worked on cartoons with deep emotions and powerful themes, but they don’t bring that same kind of substance to Voltron: Legendary Defender. 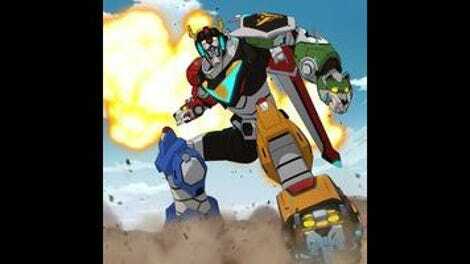 The 68-minute pilot, “The Rise Of Voltron,” features very slick action sequences and rich design work, but the script by Tim Hedrick, Joshua Hamilton, and May Chan never tries to be much more than a generic action fantasy with plenty of potential for merchandising. Voltron: Legendary Defender will likely disappoint older viewers who are looking for The Legend Of Korra’s imagination and insight; the series is specifically geared to young boys who want to see people fight with cool weapons and robots. This is a show for kids, and the simplicity of the story and characterizations works for the intended audience. The five main characters are all archetypes: Shiro (Josh Keaton) is the noble leader who won’t stop preaching the power of teamwork; Keith (Steven Yeun) is the mysterious, hotheaded bad boy; Lance (Jeremy Shada) is the cocky clown; Pidge (Bex Taylor-Klaus) is the pint-sized nerd; and Hunk (Tyler Labine) is the big softie whose appearance is at odds with his delicate nature. Given how female-driven Korra was, it’s disappointing to see this series adhere to the heavy gender imbalance of the original Voltron. The writers are clearly setting up Princess Allura (Kimberly Brooks) for bigger things down the line, but having just one woman in the core cast isn’t a great look, especially when she’s in an auxiliary role. Working with voice direction by Hedrick and the great Andrea Romano, the cast does fantastic work realizing the individual personalities of the characters, and hopefully they’ll be given more demanding material as the series continues. The pilot hits a lot of familiar beats when it comes to assembling a team, building to a big climax that involves everyone figuring out how to work together in order to defeat the enemy with their combined power. The series is about five robots coming together to form a super-robot so it makes sense that teamwork would be the big idea from the start, but exploring it on such a basic level makes for an uninspired narrative. There are some compelling story threads introduced here—Pidge’s search for his father and brother, the events of the year missing from Shiro’s memory—and the world building is interesting enough that there’s reason to stick with the show to see more of the spectacular space locales. The forest planet where Pidge and Shiro find the Green Lion is especially intriguing, sharing significant design similarities with the Spirit World of Korra and Avatar: The Last Airbender. The main attraction of this series is the visuals, and viewers who want to see the anime-inspired aesthetic of Korra and Avatar applied to a futuristic sci-fi series will be drawn to the evocative design work and dynamic storyboarding of Voltron: Legendary Defender. The direction of the pilot accentuates the massive scope of the intergalactic conflict that these young men have suddenly found themselves in the middle of, and there are some gorgeous images of the majesty of the alien settings and towering lion robots. The 3-D animation for the lions (and other assorted visual components) is smoothly integrated into the 2-D linework, and the action sequences have intense speed and force, which accentuate the might of these machines in battle. The series succeeds as an action cartoon for kids, but there’s not much here for adults who don’t have a nostalgic attachment to the original series.